Before you can program with Dart, you need to grab a copy from http://dartlang.org. I chose to install only the SDK; however, there is an option to grab the full Dart integrated development environment with the SDK included. Eclipse users will feel right at home with the IDE, because it is based on Eclipse components. Now I can run dart, dart2js and dartdoc from anywhere. The core Dart language is pretty straightforward. The basic data types available are var (stores any object), num (stores any number type), int, double, String, bool, List (arrays) and Map (associative array). All of these data types are declared in the dart:core library. dart:core is always available and does not need to be imported. Functions also can be considered a data type, because Dart treats them as first-class objects. You can assign functions to variables and pass them as parameters to other functions or write anonymous functions in-line. For flow control, you have the "usual" if, else if, else, for, while and do-while loops, break, continue, switch and assert. Exceptions are handled through try-catch blocks. Dart has a lot of support for object-oriented programming. Classes are defined with the class keyword. Every object is an instance of some class, and all classes descend from the Object type. Dart allows only for single inheritance. The extends keyword is used to inherit from a parent class other than Object. Abstract classes can be used to define an interface with some default implementation. They cannot be instantiated directly, but can make use of factory constructors to create the appearance of direct instantiation. Abstract classes are defined with the abstract modifier in front of the class declaration. Dart ships with an impressive standard library. I use a few of the libraries and classes in my examples here, so it will be helpful to have an idea of what they can do ahead of time. I can't cover all of them, but I cover the ones I personally find most useful. dart:io provides classes that let your program reach out to the world. The File and Directory classes can be used to interact with the local filesystem. The File class also will allow you to open input and output streams on the specific file. If you want to write cross-platform code and allow users to specify the path of a file native to their operating system, the Path class provides a really nice Path.fromNative(String path) constructor that will convert Windows and UNIX paths to their Dart counterparts. Also included in this library are the Socket and ServerSocket classes that can be used for traditional network communications. The HttpServer class allows you to program a Web server quickly. This is great if you want to add a custom rest API to your application. dart:io can be imported and used only on server-side applications, so don't try to use it in your browser apps! dart:math, dart:json and dart:crypto provide helpers that are hard to live without. dart:math provides all of the static math methods that programmers have come to expect. dart:json provides the JSON helper class. It has only three static methods: parse(String json), which returns a Map containing the parsed document; String stringify(Object object) and void printOn(Object object, StringBuffer output) can be used to serialize an object into JSON. Any object can be made serializable by implementing a toJson() method. dart:crypto has helpers for performing md5, sha1 and sha256 hashing. There also is a CryptoUtils class with methods for converting bytes to hex and bytes to base64. Does it look pretty familiar? It's not much different from a Java program at this point. You start by importing the dart:io library. This gives you access to the File and OutputStream classes. Next, you declare a main method. Just like Java and C, main acts as the entry point for all programs. The File object is used to hold a reference to a single file on the filesystem. In order to write to this file, you open the file's output stream. This method will create the file if it does not exist or clears the contents of the file if it does. It returns an OutputStream object that then can be used to send data to the file. You write a single string and close the OutputStream. When your program is done, you should see a file called test.txt in the same directory. Open it, and you will see your text. What's interesting about Dart is that all I/O is event-based. This is much in the same style as Node.js. Every time you call a method that performs I/O, it is added to the event queue and the method returns immediately. Almost every single I/O method takes in a callback function or returns a Future object. The reason for this design choice is for scalability. Because Dart runs your code in a single thread, non-blocking asynchronous I/O calls are the only way to allow the software to scale to hundreds or even thousands of users. Uri uri = new Uri("http://api.wunderground.com/"
//response and print the location and temp. In Listing 1, you can see this evented I/O style put to work with the HttpClientConnection object returned by the HttpClient.getUrl(Uri url) method. This object is working in the background waiting for a response from the HTTP server. In order to know when the response has been received, you must register an onResponse(HttpClientResponse response) callback method. I created an anonymous method to handle this. Also notice that toward the bottom of the program, I register an onError() callback as well. Don't worry; all of the callbacks are registered before the HTTP transaction begins. Once the onResponse() callback is executed, I pull the InputStream object out of the response to begin reading data. I register the onData(), onClosed() and onError() callbacks to handle the different states the InputStream can be in. onData() simply reads bytes off the stream and appends them to the jsonData list object. onData() is guaranteed to be called as long as there is data to read. Once the stream has hit "end of file", onClosed() is executed. At this point, I know all of the data from the HttpRequest has been transferred and read, so I can use the JSON helper class to parse the response into a Map object and print the final result to the user. This is where the program actually exits from if everything was successful. If there was an error in the InputStream, then the onError() callback would have been called, and the program would have exited from there. Now that you've seen what Dart can do on the server side, let's take a look at what it really was designed for, the client side. Dart excels at programming large-scale browser applications. Unfortunately, space constraints prevent me from showing a truly large application. 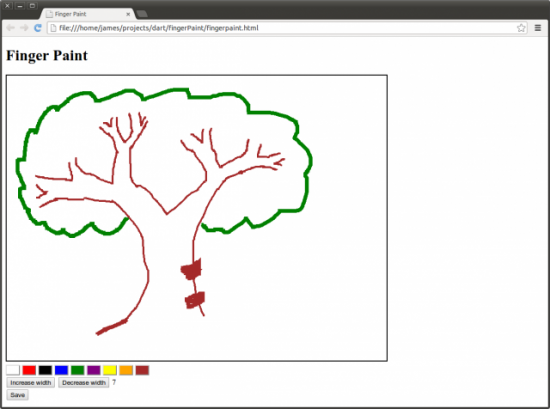 Instead, I cover a not-so-large but very cool application using the HTML5 Canvas object. Let's use Dart for finger painting. In our simple finger-painting application, there will be buttons for each color that is available to users, as well as buttons to increment and decrement the thickness of their strokes. What good is painting a masterpiece if you can't save it and share it with the world? So, let's make a save button that will convert the canvas to a PNG image. Now let's take a look at the application itself. At the top of Listing 2, I start the program by importing dart:html. All client-side applications must import this library to have access to the DOM. Next, I create a class called DrawSurface that will act as a container class for the canvas object. The constructor takes in a CanvasElement and grabs its 2-D-rendering context. It also registers all of the callbacks to handle mouse movements on the draw surface. When the user presses down on the mouse, somewhere on the draw surface canvas I begin a draw path. As the user moves the mouse around with the button pressed down, I add line segments to the drawing. When the user releases the mouse or moves out of the canvas element, I close the drawing path. I implemented getters and setters for the color and lineThickness attributes. In the setter methods, I make sure to update the rendering context on any change. I also add two methods incrementLineThickness(int amount) that will allow the user to adjust the lineThickness by some amount, instead of just setting it, and getPNGImageUrl() to expose the canvas element's toDataUrl() method. This method will allow the save button to function. In main, I use the static query(String selector) function to get the canvas element by its ID. The query function takes any CSS selector and returns an Element object that matches it. If there is more than one element that you want to access on a page, you can use the queryAll(String selector) function that will return a List<Element> object. I use this function to gather up all of the color buttons at once and register onClick() events to set the current color to its respective ID value. Finally, I register the callbacks for the size-up and size-down buttons that change the thickness of the line by 1. I also register the callback for the save button to grab the PNG data URL from the canvas and open it in a new window. The user then can save the image by right-clicking on it and choosing "save image as". Dartium is an experimental browser, so it should be used only for developing Dart applications locally. Don't use it as your normal browser! There might be security exploits or stability issues that have not been discovered yet. Figure 1. 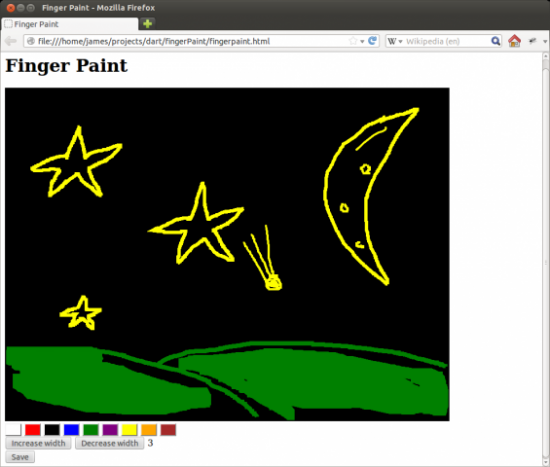 The finger-paint application running on Dartium, a special fork of Chromium. When this is done, you will see several new files, including fingerpaint.dart.js. I would love to tell you that the community has welcomed Dart with open arms, but that's simply not the case. The people in charge are afraid of Dart becoming the next VBScript and hurting the open Web. So far, Microsoft, Mozilla and Apple have rejected the idea of embedding a Dart runtime into their browsers. As Dart matures and gains popularity, I hope to see this stance reverse, but for now, dart2js is the only way to get Dart projects on-line for all to use. Dart is a fantastic language that presents an entirely new approach to writing large-scale, client-side, object-oriented applications. I have enjoyed working with it, and I hope you will too. The potential of this language is limitless, and I hope to see wide-spread adoption of it in the future.